Report back on the workshop focused on coding the SACOMM conferences from 2011 to 2016. Over forty MA and Honours students attended the short workshop. For convenience, they split into five teams based on where they sat. 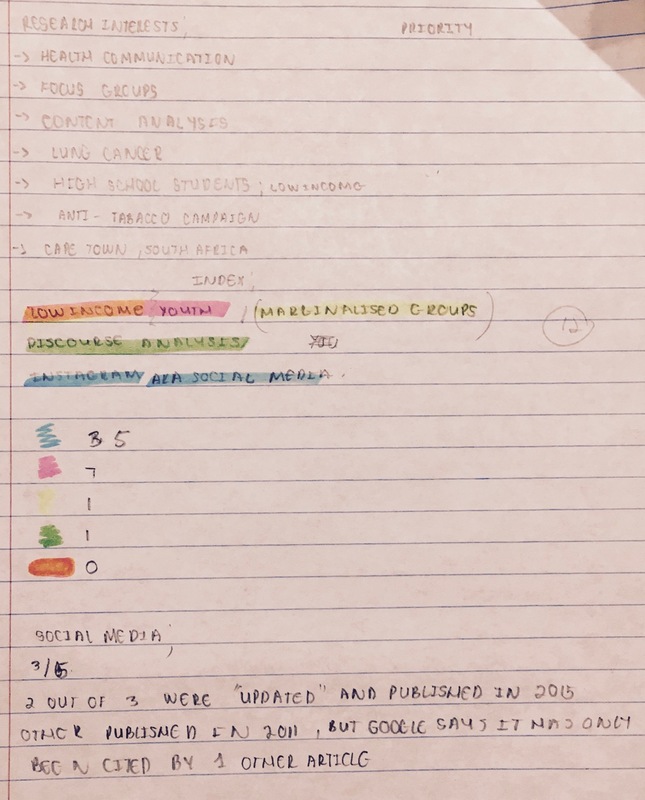 No teams used software for coding (while two Masters students planned to use NVivo this year, neither had installed it or done training*), but rather used highlighters, pens or pencils. 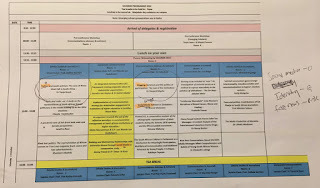 In phase 1, each group focused on coding one whole programme (excluding their plenaries, workshops or sections without authors/titles) rather than a particular section. Teams preferred this approach as students tended to have very different individual foci, making it difficult for them to focus on just one section. The workshop’s timeframe proved overly-ambitious: the groups took longer than anticipated to define their shared themes and create a team coding index. There were also more basic queries; i.e. on what a conference is, who gets to participate, etc. Despite individual diversity, it was notable that all teams shared ‘social media’ as an interest. Themes linked to social origins, identity and health advocacy also proved common. Social media has been covered increasingly at SACOMM from 2011. It has risen from just a few to over 50 citations. However, in my review of their codings, it was evident that some teams used ‘social media’ too broadly (for example, covering any papers that included ‘internet technologies’ or ‘technical policy’, which would not accord with a strict definition of ‘social media’). While advocacy was well-represented by many presenters at IAMCR, it has been poorly represented in SACOMM conferences. Linked to that, issues related to marginal identities, decolonization and Africa were seldom focused on by SACOMM's presenters between 2011 and 2016. In doing their coding, students had to decide on changing topical theme words (i.e. ‘fake news’...) to synonyms (... changed to ‘propaganda’) for achieving matches. Some students noted that the lengthy gap between conference submission and acceptance (6 months) would seem to pose an obstacle for "hot topics" to be addressed at SACOMM. By contrast, team E also identified where topical trends for the year, such as #feesmustfall, had been addressed by several speakers. 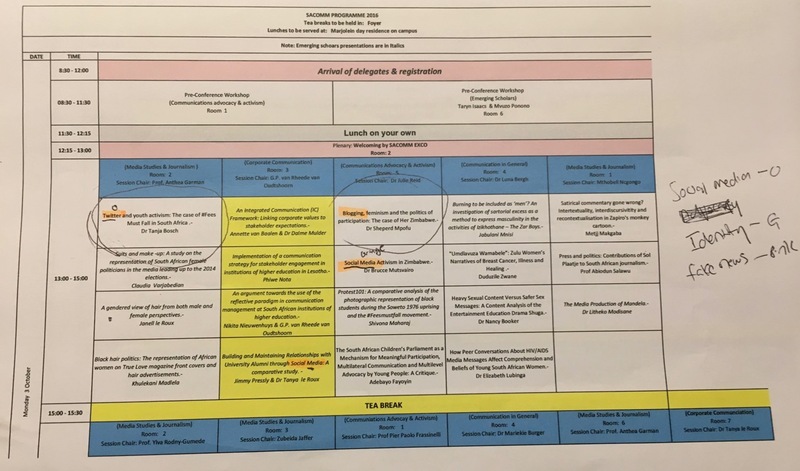 Such disconnects (2&3) between the teams' interests and the conventional foci of SACOMM's presenters seemed mirrored in students' disinterest in attending; at most, three would attend 2017's conference**. Its theme is 'Locating the power of communication in a time of radical change' and its presenters may well focus on topics that resonate better with postgraduate UCT media studies students' thematic interests. 2016 saw the emergence of a very energetic 'emerging scholars group' at SACOMM managed by a team of PhD students. They should hopefully also be highly visible at the Rhodes conference (email feedback from Professor Keyan Tomaselli). Each team selected five papers that resonated most with their shared focus. 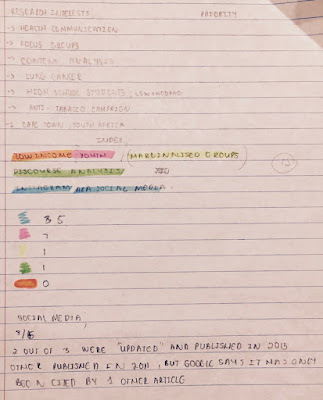 The teams did online searches to explore different types of research impact; four focussed on which presentations were linked to online publications, while the fifth focused on researchers’ different types of social media presences and whether these were linked to SACOMM papers. 1. For research articles, the impact following paper presentation was highly uneven. 2. It proved hard to source any of the original papers (or presentations) online. Such poor online availability seemed tied to the optional status of submitting full papers to SACOMM. 3. Most of the research articles linked to papers had few, or no, citations. 4. A well-cited paper on Arab bloggers seemed timely in presaging the major political uprisings of the 'Arab Spring'. 5. Researchers differed widely in using social media platforms, which ranged from Facebook to LinkedIn and ResearchGate. Few academics used a combination of platforms to create an overall online identity as an academic researcher. Feedback on the workshop was mostly positive as it provided many students with their first view of a conference programme and its coding assisted them to establish a broader view of local work done in their field. Two changes could improve the workshop significantly: In hindsight, I should have prepared a worksheet for each team’s leader to complete as a target. Figure 1 was the best example of a hardcopy summary; the other teams' provided less information (for example, see Figure 2's summary) or even none. I briefly addressed using Google Scholar Advanced Search syntax, but should also have printed out hardcopy guides for students' ease-of-reference. Worksheets would also have been helpful for checking students' application of search syntax. * One student plans to do a social media project looking at two international church groups’ Facebook page branding in South Africa, the other student plans to explore an under-resourced fishing community’s use of social media in Hangberg, Hout Bay. ** One student had submitted an abstract and one would attend as part of her job, if asked.